I hear people bringing up "man cards" all the time or threatening to revoke another man's card because they ordered a piña colada instead of a pale ale or because they don't hunt deer from dusk till dawn. I've got no issue with fruity drinks, though I prefer a German Marzen myself and I don't hunt, but take little issue with it either. 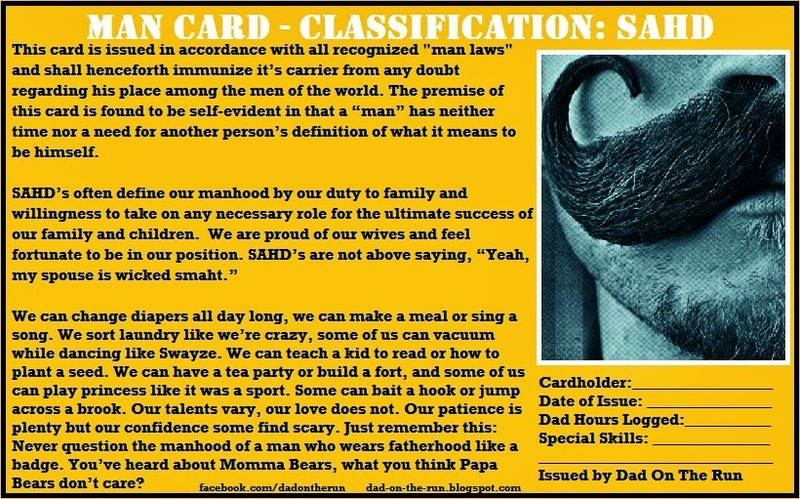 Anyway, I gave it some thought and came up with an SAHD approved man card. It was time as many of the manliest men I know care for their kids all day long. Here's to you! You'll have to keep looking for your talented reader, although it would be cool to see once it's done. And a great version by the Foo Fighters. Hadn't seen that one.